It’s been a cloudy, cool start to the summer throughout much of the Northeast. So when I departed Boston for this year’s National Educational Computing Conference (NECC) in Washington D.C., I was ready to feel some heat. It was my fifth consecutive NECC and the 30th anniversary of the conference. NECC attracts around 20,000 educators from around the world who are passionate about designing and developing digital-age learning experiences. The digital universe has grown so vast that it’s easy to become overwhelmed by the complexity of processing and synthesizing new information. My compensation strategy is to use concept mapping to emphasize important ideas gathered during the conference and attempt to relate them to practical classroom use. The concept map to the left was created with the new MyWebspiration web application (view the web version). A web application runs entirely through your web browser. There’s no software to download and install. Why would the makers of Inspiration software decide to create a web version? The answer can be found in the CLOUDs. These aren’t those pesky precipitating clouds, but rather an array of computers pushing virtual versions of software through the Internet into your browsers. NECC was dominated by these cloud computing solutions. One major issue for schools is the need to constantly update software on individual computers. The cloud version of Inspiration requires a browser with a stable Internet connection. Now here’s the real kicker, myWebspiration concept maps can be shared and edited by multiple users. Imagine assigning your students an assignment to collaboratively visualize books for homework. The cloud metaphor is a good one to characterize the current status of educational technology. 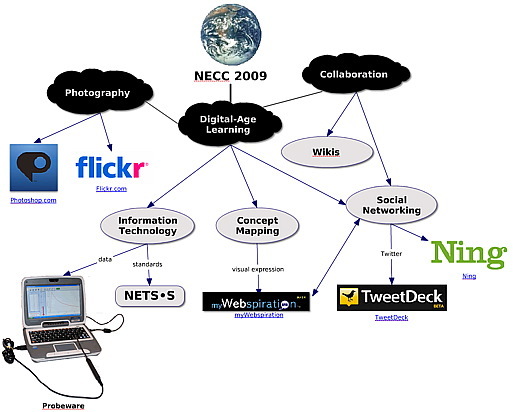 I spent NECC 2009 thinking about the creation of compelling Digital-Age Learning environments. MyWebspiration concept map shows a link between the world icon, NECC 2009, and a cloud symbol containing Digital-Age Learning. Controling clouds is notoriously futile therefore teachers will get wet. 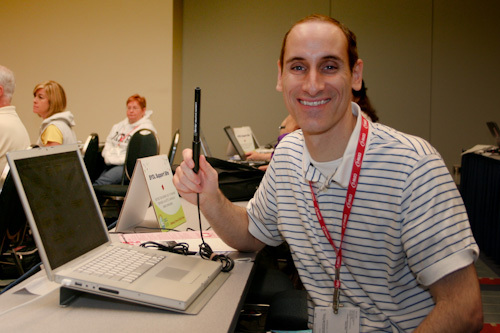 Your students will benefit from Information Technology experiences such as collecting temperature data with a USB probe directly into a computer and then sharing through the Information Technology in Science Instruction portal. Social Networking is also critical for making your curriculum global. Educators are using Twitter and Ning to create social networks that bring students together to design solutions to real-world problems and build their digital literacy skills. Photography and Collaboration are also given the cloudy treament. Adobe Photoshop.com enables image editing through the web. flickr is one of the largest photo sharing communities on the web. Wikis are the single best method for initiating a web collaboration. I created the NECC09 wiki page to share information and resources with K-8 educators back home. To document my NECC experience, sessions and workshops were listed by date with notes posted as text comments and concept maps! Selected photos were either embedded into the page or streamed from my flickr account. How will you share your NECC09 experience? This entry was posted in new technology, Web 2.0 and tagged cloud, cloud computing, concept mapping, digital-age learning, myWebspiration, necc, necc09 by Robert Simpson. Bookmark the permalink. We are glad to see that you have discovered Webspiration, and see the advantages of using it for visual thinking and collaboration. Since you are already using the collaboration capabilities, you might want to check out the Chat function, if you haven’t already. Chat is a great way to have an online dialogue and comment on a document, while maintaining the integrity of the document. In addition to using Webspiration with students, many educators are using Webspiration to collaborate with each other for staff development and planning as well. The great thing about Webspiration is that it can be used with Inspiration to give students access to visual thinking and learning tools in the classroom, at home, or at the local library. Webspiration is ideal for initial brainstorming, note taking and collaboration. Inspiration takes over from there and provides a wider range of visual thinking and learning capabilities, as well as more powerful organizing and outlining capabilities. We look forward to seeing what you do with visual thinking in your classroom!